The death of Robert Sargent Shriver, Jr. is a great loss for America. His leadership and activism in fighting poverty, promoting peace, and creating a more compassionate society changed our nation and world for the better. 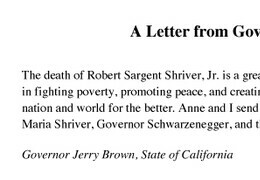 Anne and I send our heartfelt condolences to former first lady Maria Shriver, Governor Schwarzenegger, and the entire Shriver family.